Ásbyrgi has a fantastic soundscape. It is one of the wonders of nature, a forested horse-shoe shaped canyon in Oxarfjordur. Asbyrgi is a part of Jökulsárgljúfur, within the Vatnajökull National Park. I was there recording over night for ten hours 1st. of June 2018 . I don´t know if it was the time of the year, or something else, but the cliffs were very quiet this night. Usually I have been there later in June and July and the Fulmar in the cliffs have been noisier. It was around 8 o´clock in the morning, just before the tourist traffic arrived that the soundscape in the canyon changed. It was like the whole biosphere woke up with lots of birds and insects activity. The following recording is the last 30 minutes that day before the soundscape was ruined by traffic noise and yelling tourists. Several bird species are in this recording. Northern Fulmar, Common Snipe, Eurasia Woodcock, Whimbrel, Red-Necked Phalarope, European golden Plover, Pink footed Goose, Eurasian Wigeon, Eurasian Teal, Redwing, Common Redpoll, and Snow Bunting. 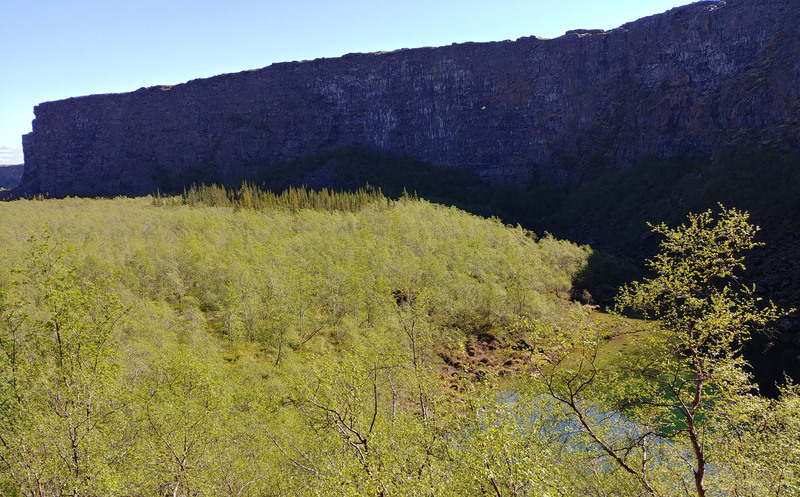 Here you can also listen to older posts from Ásbyrgi: Fairy in Ásbyrgi and Botnstjörn pond in Ásbyrgi. Lovely recording, there’s certainly a wealth of birdlife there, but those flies must be annoying – they sounded large, do you know what sort they were?